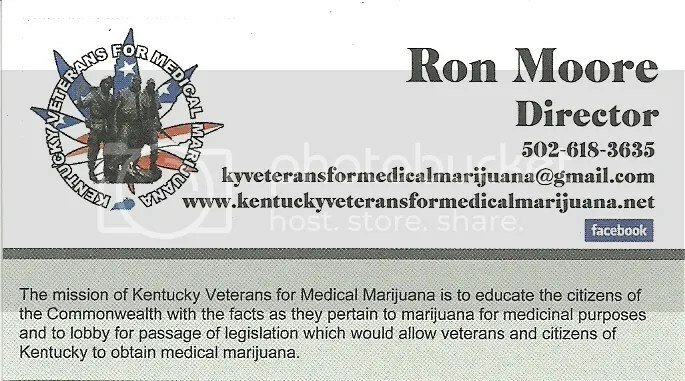 Kentucky Veterans for Medical Marijuana – on Facebook! My Father is 73 years old, he is a Veteran of the US ARMY. He did 2 tours of duty in Vietnam. He was exposed to Agent Orange, he has many illnesses and much pain. My Father has never smoked marijuana in his life (unless maybe he did it in Vietnam…) he does NOT smoke, he does NOT drink. His liver has been damaged so badly by the many medications he currently takes. I just want the man to be in less pain. I don’t smoke (anything, including marijuana) so I know absolutely nothing about medical marijuana or how it works. He is also a diabetic and he has Parkinson’s Disease. I don’t know how medical marijuana is prescribed, but I know he won’t smoke anything. How could this benefit him and how do we go about getting information? He is currently under the care of the VA in Lexington, KY. Any information would be greatly appreciated. I think you should talk to his doctor about CBD use. It may benefit him greatly since he would not prefer to smoke and since THC isn’t yet legal in KY. I appreciate all the support towards more equitable health options. I recently went to my orthopedist specialist and was prescribed medication that would cost over $900 dollars for one tube of the pain relieving ointment. I have an excellent doctor, who is forced to practice in a terrible health care system, where insurance companies and greedy medication manufacturers rule. The insurance company would not cover the cost of the pain med, neither would medicare, so I had to book another visit to find other options. I have been prescribed many legal medications, none that would be covered by medicare. Marijuana does not have to be smoked. It can be put in edibles and forms of it can also be used without any of the other side effects. I have not ever used it, but would like to have the option to try it legally. The rest of the world is already doing this to the betterment of their patients. We need to protect the rights of the consumer in this country and not the out-of-control non-regulated greedy corporations that have us at their mercy. Thanks for your comments. I will no longer be able to participate in this discussion since the pain in my wrists and limbs have made it impossible for me to writing on line without painful consequences. Best Wishes and Blessings for those that support legalization. Thank you so much for your submission! I am so sorry you are having so much trouble with health care and pain. I’ve been told numerous times that i should move to a legal state but have stuck it out here. Why? Because it is the place I was born, have known all my life and love and I have family here. I also know that even know KY is slow to start, eventually they will get there. So I wait. For a repeal of a law that never should have happen, and the right to grow a plant in my house or yard. Waiting in pain most of the time because of it. As far as what you are suffering, please look into CBD oil which can be real beneficial and is probably legal where you are. Please consider those of us who suffer chronic pain due to Post-Polio Syndrome. We have very few studies that have showed any medications that we can use effectively to manage our neural and chronic pain, but most PPS sufferers find cannabis one of the easier ones, with less damage to our digestive and cardio systems. There are over 600,000 of us in the U.S. alone, suffering from the long-term effects of having had child-hood polio and our nervous systems start breaking down faster as middle-age adults because of it. Some of us have to use mobility devices and suffer a range of problems even sleeping, swallowing, breathing, while tolerating constant pain with few medications that actually can give relief. I love living close to my loved ones in Kentucky, but have not had any success with the legal pain medications prescribed by my doctor and the pain is worse all the time. It is a great hardship for me to have to move to Colorado, but I fear I will not have an alternative if the laws continue to obstruct proper pain management for my condition. Thank you for anything you can do in future to leave it up to the physicians to prescribe treatments as they feel is best for their patients, instead of the pharmas, insurance companies, and corporations through the legislators that give them more representation than the people that suffer the consequences. It is extremely sad that our democracy has deteriorated into a state that manipulates even our health and survival to reap more money for the powers that be, instead of the people. In the meantime, other developed countries maintain free health care based on the best treatments available for their patients without delays and interference from insurance companies that do little more than spend on advertising and reams of redundant paper that fill our mailboxes and kill our forests. I have to pay for B-12 shots for my spacticity because Medicare will not cover it, even though my doctor prescribed it, but I never dreamed that a pain medication she would also prescribe would be deemed illegal for no good reason, while the FDA still allows the sale of toxic tobacco cigarettes at a greater cost for society. I hope my cries and those of others do not fall on deaf ears. and many others that cause chronic pain. These decisions should be left to the Health Department and Physician’s to set the standards and regulations as with any other prescribed drugs that have shown clinical improvement. Recently even the FDA, found that cancer cells would be slowed down due to TSH in cannabis. How is it possible that Thalidomide is back on the prescription list, and medical marijuana is not? We need to have a Health Counsel make these decisions and not those with a possible monetary conflict of interest. If I had the stamina, I would run for office to change these and so many areas where we are all getting short-changed due to lack of education and better decision making. Vote your consciousness and not out of fear, and vote Green for a better future. Sounds like you’re going down one long dark rabbit hole. Marijuana use causes severe paranoia and is a stepping stone to the abuse of other illegal drugs. My best advice is to see a good orthopedic specialist and take only prescribed FDA approved medications. Be well. The funny part is that the FDA is racing as fast as it can to corporatize LEGAL marijuana medicines so that every PHARMA can capitalize on it in a “legal” way…..Wow, Mercedes, please read a little further and follow the links to real information! Marijuana increases appetite and when a person has limited mobility, weight gain will only make it harder for them to move around and increase their pain. One bad choice will lead to another, soon they’ll be taking amphetamines to lose weight and that is a bad roller coaster ride. Smoking anything is also bad for your lungs, ask any cancer research manager. We live in the best country in the world with the best doctors and medical centers, there are better ways people, Seek and you shall find. I appreciate your opinion. But this much is true, I have been, myself, and either know or have met many other patients who have been victims of the health care system – so you learn to question things, and say no to things, and not accept anything they tell you at face value. That having been said I am thankful for the Doctors who saved my life on a couple of occasions! There IS a place for the typical and maybe even research based healthcare that is available in the U.S. and other Countries as well. But some of these same Physicians and also ones responsible for approving the Statutes and Treaties that made Cannabis ILLEGAL in the first place were and continue to be somewhat evil. It is proven fact that this medicine was sold in the Pharmacies across the Country until late 1930’s. It was proven to help epileptic’s as well as a lot of other uses. WHY would I base my life, totally, on what THEY tell me to do? That just does not make sense to me. Cross examine? I’m a 100% disabled veteran with multiple service connected disabilities. I’m a full time stay at home dad to my three year old and I’m blessed to be able to watch him grow. I’m fully aware of the benefits of medical marijuana and I have a degree on the subject. I reside in Kentucky and I feel ashamed that our leaders haven’t done something more to legalize medical marijuana at our state level. Do they feel the same? Probably not. They haven’t had to live with debilitating illnesses caused by war, disease and illness. We as veterans have a strong voice in our communities and it’s time we stand together and scream to the top of our lungs that the travesty of not legalizing and decriminalizing marijuana will no longer be tolerated. We deserve to be able to have access to any and all cures and cares at our disposal. I feel that my fellow vet brothers and sisters feel the same. LETS DO SOMETHING ABOUT IT!!! I am a Kentucky veteran with PTSD. I’ve used pot in the past to help me deal with things from 1967 when I was in Vietnam until 2ooo something. In 1970 I was in the Louisville, Ky. V.A.M.C. for what became PTSD all they did for me was too fill me full of drugs. Drugs like those only make you homeless. Pot let me make some money doing small home repair. All of my Doctor’s know that I smoke it’s in my medical records has been for over 40 years. If I can help let me know.